I'm quite pleased with my banner, not in the least because it proved itself to be so difficult to make. I did try to replicate the old one, going to the Blade Runner sim and using the fall poses, but it wasn't quite working out for me. 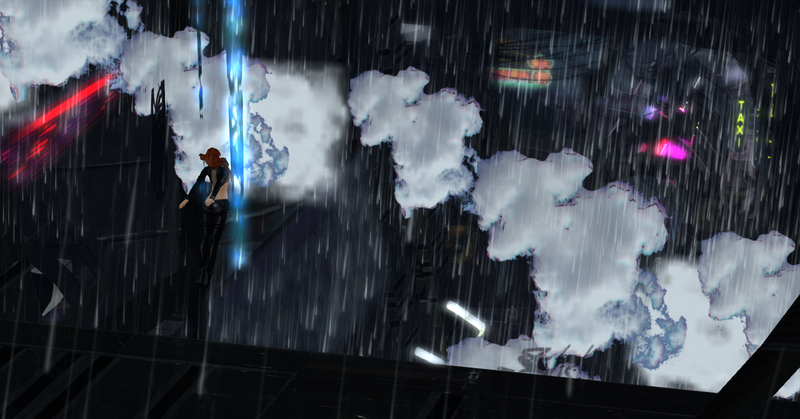 So I went to one of my new favourite places, Hangars Liquides, and began throwing myself off buildings. That isn't a joke. There are, at the present at least, no handily set-up falling poses in Hangars Liquides, and I wasn't sure how else to get a falling shot. I made Kitti fly - HL is one of the few sims that actually lets you fly! - up high above a road, then positioned the camera just above the road, looking upwards. 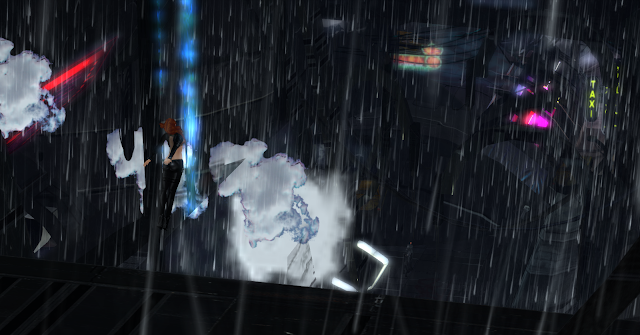 Then I hit the 'stop flying' button, meaning that Kitti would plunge to her death. I think I get brownie points for the idea, but no matter what I did, I couldn't lie the camera up with Kitti and she would end up landing just behind where I'd positioned the camera. At the time, I didn't think of doing a blog post about it, so I didn't keep any of the out-take images. Sorry. After a few tries, I gave up, and went onto the marketplace to look for a set of falling animations. I found one, though the animations in the pack seemed to have more agency than simply 'falling'. 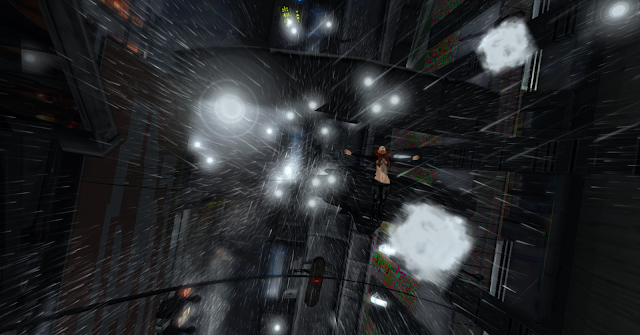 They were all 'falling-on-purpose' or, like the one I ended up using for my banner, 'jumping off a ledge'. But I figured that, with a pretty cool sci-fi outfit and a pretty cool sci-fi city like Hangars Liquides, jumping off a ledge could be. Well. Pretty cool. There were a few hiccups. Positioning my avatar right on the edge of the bridge-thing proved difficult, and sometimes Kitti fell off. But then I realised that I could activate animations whilst flying, so I could fly up, position myself just off the ledge, and use the jumping animation to make it seem (hopefully) as if Kitti had just leapt off. Looks like I'm virtually on the edge, right..? An attempt to use a falling animation whilst flying...didn't quite look right, though the rain looks pretty cool! Somehow, I seem to have positioned Kitti just on the outside edge of the rain, lol! To become a fan girl, just for a moment: I really do love Hangars Liquides. Before I got my new laptop, there is no way I could have gone there and seen all this. It is a beautiful build, created with such attention to detail, and, in places, such a sense of humour. It's stunning, and this section with the rain is, at the moment, my favourite. The builder, Djehan Kidd, is incredibly talented, and incredibly nice, and the sim owner (I believe that's what he is!) Lawrence Celestalis is kind and charming and full of fun. He spied me whilst I was trying to position Kitti for these shots and was giggling at me and asking if I needed him to come and catch me. Hilarious. Once I'd finished, he offered me a teleport link to join him and Djehan in a different part of the sim where he had decided to rez a tank and take us for a ride. A tank, ladies and gentlemen. I also asked Lawrence if I might take shots here for my Kit 49 comic, which has been suffering since I have run out of places in the original sim I was using to take shots. He said yes. Exciting!